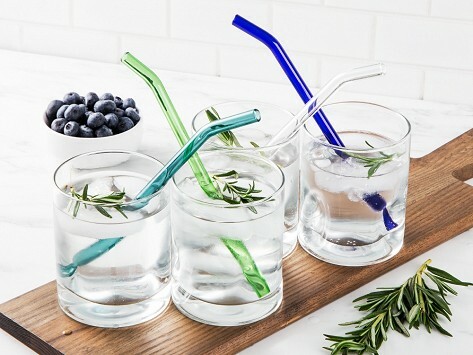 A Strawesome glass straw set is a handcrafted and beautifully-made alternative to plastic straws. Sip easy knowing you’re making a difference with straws that feel extra-special. The four straws are made in Michigan with super-durable, non-toxic borosilicate glass. This material is used in the windows of space shuttles and can handle extreme temperatures. The straws are safe to go through the dishwasher and because you can see through them, you know they are really clean. Guaranteed to last a lifetime. Great product. Very well made and just very happy with the purchase . It arrived well packed . Strawesome glass straws are made with the mission to ditch plastic straws and they do it in a beautifully handcrafted way. Makers Daedra and Brian Surowiec are passionate about eliminating plastic waste. They’ve been at work since 2009 creating the straws that they consider functional art pieces that are better for the environment and better for people. There are no harmful chemicals in the straws and because you can see right through them, you know when one is really clean.The straws look lovely, but are far from delicate. Each is made in Michigan with super-tough, non-toxic borosilicate glass and is backed with a lifetime guarantee. How tough is it? This type of glass is used in the windows of space shuttles because of its strength and ability to handle extreme temperatures. Sipping from a Strawesome straw feels special, too. Want to take it to go? Pop a straw into its very own (adorable) carrying case so you always have an eco-friendly alternative on hand. Switching to a glass straw might seem like a small thing, but it’s one small thing that can have a big impact.